There are numerous kinds of mites, also known as spider mites, and many feed on plants. They congregate in dense colonies in webs on the undersides of leaves. Symptoms of their feeding show up as silvering or a stippled effect on the leaf top, but the precise symptom varies with the plant. Turn over affected leaves and you're likely to find spider mite webbing; if you rub the leaf it will feel gritty. 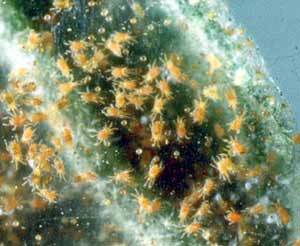 Mites feed on many kinds of plants, edible and ornamental. Houseplants are a favorite target. Hot, dry, and dusty conditions encourage mites. Keep plants well watered and wash them off frequently. If you detect an infestation, first spray plants with a forceful stream of water to knock mites from the leaves. If the infestation persists, spray plants with insecticidal soap or horticultural oil, covering the undersides of leaves thoroughly. In orchards, buy and release predatory mites, and encourage any that are already present by not spraying insecticides.